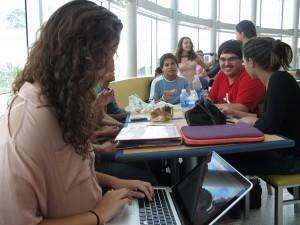 Vanessa Richter, 17, works on her online summer course as her friends eat lunch at a food court. Last year, Luis Gonzalez failed freshman English, Algebra and Physical Science. When he starts school later this month, he’ll still be considered a freshman. His school has a different name for it. Gonzalez thought he could make up the classes during summer school. But summer school wasn’t an option for the Pasco County student. Because of budget cuts, Florida’s largest school districts say they cannot offer summer school to everyone who needs it. Only some students get to attend – and juniors and seniors are the priority in counties such as Pasco, Miami-Dade, Hillsborough, Orange and Duval. It may teach the 16-year-old to do better in school next year. But having few summer school options also makes it harder for Gonzalez to catch up to his peers. The risk is that he keeps falling behind. By law, Florida districts aren’t required to offer any summer school – with one exception. Districts must offer a summer reading camp to third graders who failed the FCAT reading exam. In recent years, most districts have cut back on their summer school options. Ella Shanks is in charge of curriculum in Orange County. She says summer school is no longer for every student. BrowardCountyoffers no summer school at all. In the nation’s sixth largest school district, there’s only night school for high school students, and those night classes are all online. Tampaalso offers night school to some high school students, but again, it’s based on seniority. In Orlando and Miami, there are also summer options for 6th, 7th and 8th graders who are at risk of not being promoted to middle or high school. In 2008, the last year Miami-Dade offered summer school to everyone, it spent $16.7 million. The cost of the reduced summer options it offers now is $5 million. Rising senior Stacy Soriano says she knows schools are facing tough budget cuts. Still, she thinks struggling students should get face time with a teacher over the summer. “I would not cut summer school for kids who failed a class,” she said. The 17-year-old failed Algebra II at Terra Environmental Research Institute in Miami, so she’s re-taking the class online through Florida Virtual School. Virtual school teachers are not required to be online at the same time their students are. If Soriano needs help with a math problem she calls or texts her teacher. It’s almost the end of her summer break and Soriano is only half way done with the online course. Is Florida Virtual School Replacing Summer School? At the start of the summer break, students enrolled in 141,579 Virtual School courses in June. That’s up from 85,252 courses in June 2011. That doesn’t mean students completed each of those courses — just that they enrolled. Students may have dropped the courses or not yet completed them. Student enrollment in Virtual School during the school year isn’t as high. In December 2011 — just before the start of the spring semester — students enrolled in 19,182 Virtual School courses. More than 148,000 students completed online courses through the Florida Virtual School this year. That’s up from 122,000 students the year before. But it is hard to tease out how much of that increase is due to fewer summer school options at the district level. The spike in enrollment may be attributed to a new law requiring all 9th grade students to enroll in at least one Virtual School course before the end of their first year of high school. Robin Winder is what you would call a superintendent of Florida Virtual School. She works closely with districts to fill the needs of students during the school year and the summer. But when districts start limiting their summer school options, students say online classes become less of a choice and more like a last resort. Jody Gaver is the guidance director at JP Taravela High school in Broward County. She says online classes are replacing traditional summer school. Students like rising senior Vanessa Richter, say online classes are a good opportunity to get ahead over the summer. “But I really don’t think it’s ideal for someone who failed a class,” she said. If it was her only option to retake a class over the summer, Richter says she would hire a tutor.